Today the new school year starts for most uni students and a few others (I’m guessing). To me new school year means new fitness resolutions. This year I started ahead (see this post) so that I wouldn’t look too ridiculous when I go back to my usual sport classes at uni. This semester I’m thinking about attending Zumba, Fencing, Aerobics and maybe Yoga. The thing with uni classes is that they sometimes take place during lunch. This means that more often than not I have to transform myself from sweaty red monster to fresh looking student in order to attend my afternoon lectures. After a few mistakes I think that I’ve come up with the perfect kit to achieve that transformation and to have a pleasant sport session. It is also not too heavy to carry around with me all day. I always make sure that I have a clean pair of socks in my bag because no one wants to exercise bare foot or have to keep sweaty socks on afterwards. The first step of the transformation is the shower (duh) so I take my pink microfibre towel (doesn’t take up a lot of space – perfect!) and a shower gel. I don’t usually wash my hair simply because it’d take too long so I make sure that I have some dry shampoo with me to freshen everything up. And my Tangle Teezer to tame my mane. Face wise I use face wipes to start with a clean canvas and apply a bit of BB cream and concealer to my reddened face and a dash of mascara to my lashes. I finish off with a bit of powder to keep it all shine-free. 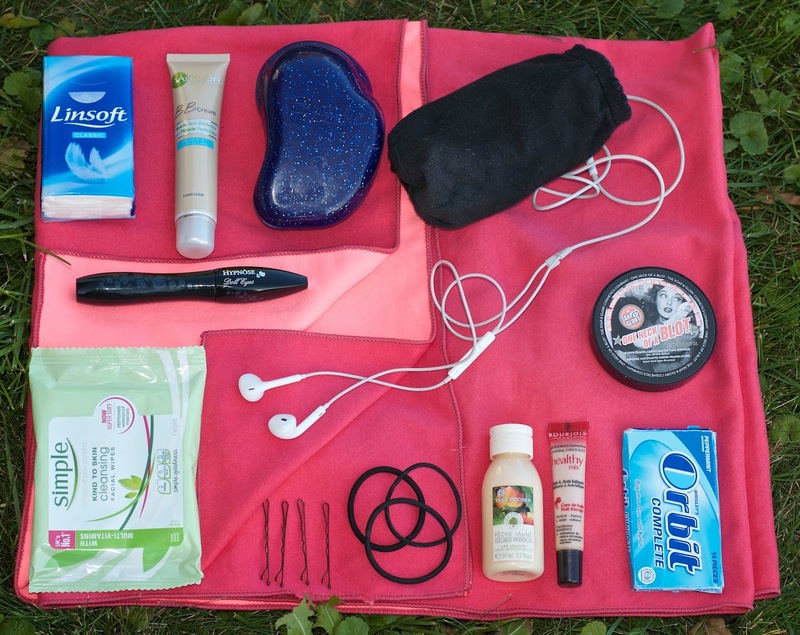 Other miscellaneous objects include a pack of gum and one of tissues because that’s something you always need. This is all you really need to make a cute version of yourself after an intense workout ! 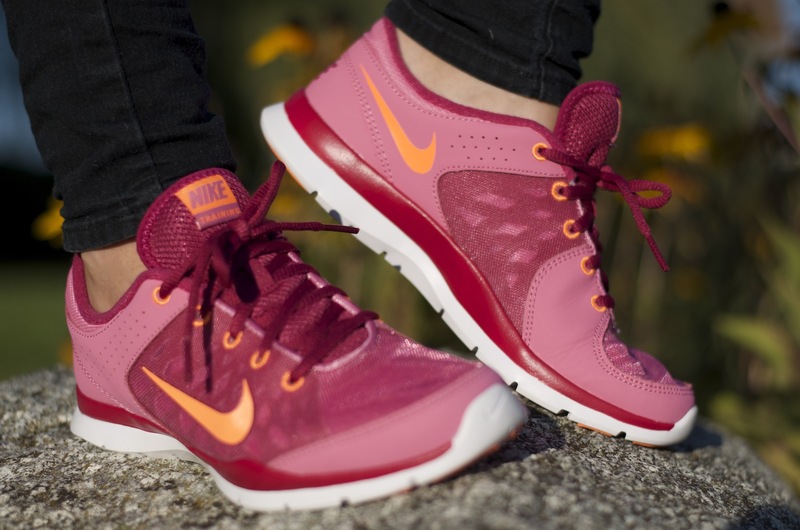 But the favourite part of my gym bag still are my brand new bright pink’n’orange in-your-face Nike trainers !!! 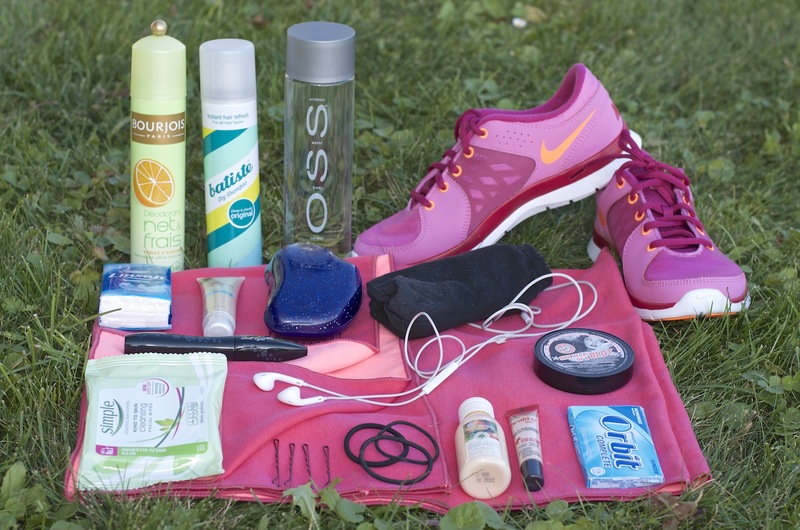 What are your gym bag essentials ?